The DiabloSport Trinity is the most advanced tuning device on the market. With the capability to tune, log and record data, display and customize virtual gauges, read and clear trouble codes and even compute multiple track times, the DiabloSport Trinity is the answer to all of your EFI tuning needs. 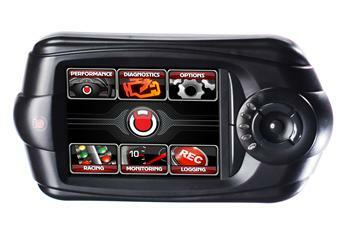 The DiabloSport Trinity also has the capability to control / communicate with external devices such as the DiabloSport Extreme PowerPuck, DiabloSport EGT Module and other third party devices. Tune multiple supported vehicles (only 1 at a time). The most adjustable parameters on the market including speed limiter, tire sizes and many more!